Collecting antique bottles can be a lucrative hobby. Glass bottles began to be manufactured around 1850 and were used for beverages, cosmetic products and household cleaning supplies. Determining the date of a bottle helps the collector to determine the value of the bottle before purchasing it or trying to resell it. The use, type of glass and even the molding of the bottle can help the collector identify it. Observe the shape and color of the bottle. The shape of the bottle can illustrate what it was originally used for, helping you to identify its purpose and approximate age. Apothecary and medicinal bottles are small and are blue in color. Bottles that once contained poison or dangerous cleaning chemicals will also be blue. The shape and color can also help determine the age of the bottle. Blue glass bottles for household cleaners, medicines and poison were manufactured from the 1870s through the 1930s. Observe the bottle for any embossing or markings. Most bottles with embossing were manufactured after the late-19th century into the mid-20th century. This embossing can also help you identify the original use of the bottle. For instance, beer bottles made before the 1950s generally have embossed lettering that says "porter" or "ale." Similarly, many apothecary bottles will have embossing that identifies their original use, such as "poison" or a brand name. Check the base of the bottle for imperfections. 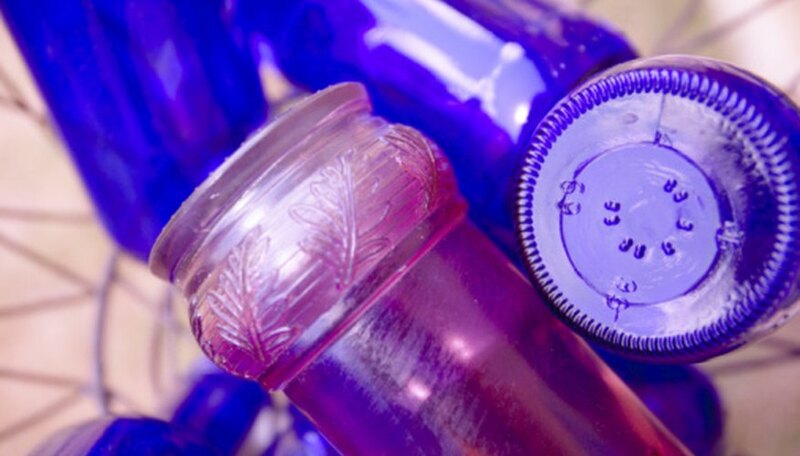 Prior to the 1860s, bottles were hand-blown, and the base of most of these bottles has a "scar" from where the bottle was removed from the blowing pipe. If the bottle is smooth on the bottom and has a series of numbers, it was manufactured after 1860 by a machine. Observe the lip of the bottle to determine if it was sealed by a screw cap or a cork. Bottles handmade made prior to the 1850s were sealed with a cork; the lip will have a flared shape to accommodate this method of sealing. In the early-20th century, screw tops became popular, and shape of the lip adjusted to include a ridge where the lid sat. Check for labeling or painting on the bottle. In the 1940s, embossing bottles became outmoded and manufacturers began painting the labels directly onto the glass. This can also help you identify the original use of the bottle. Check the bottle for mold seams. These seams are only present on manufactured bottles; they occur when the molten glass is poured into a mold. If the bottle does not have mold seems and also displays a scar at the bottom, it was handmade prior to the 1850s. Some bottles may also have partial seams, which occurred during the early process of bottle manufacturing. If the seam begins at the base of the bottle and only goes halfway up, the bottle was most likely manufactured sometime between 1850 and 1915.